I have never liked E.P.’s. I remember when I was a kid and some band had decided on releasing an E.P. instead of a long player, it would piss me off big time. I mean, why would you want to buy a record with five songs on it when you could have the double amount? To this day, I hate E.P.’s. When I read that some band will release an E.P. to raise the interest for their real product, I couldn’t care less. Many are the E.P.’s out there that I have missed because I turn quite obstinate when I have an idea planted in my head. Today, some bands has gotten it in their minds that E.P.’s are the way to release music if you want to release an actual piece and not only mp3 files (which are even worse!). Because, they say, people can’t handle more songs than, like, five, anyway, these days. What a load of a crap! Sure, people can, but ok, many kids are just downloading songs – not albums – when they want their music digitally, but if that’s the case then it doesn’t matter if you release 10 songs or five. Anyway, Skid Row are one of those bands, but even if the format itself pisses me off, the only way to get hold of any of their new music is to get hold of their damned E.P.’s, so it’s either that or no Skid row music at all. When it comes to the first two Johnny Solinger fronted Skid Row albums Thickskin (2003) and Revolutions Per Minute (2006) – knowing what I know now – I would actually had been better off not listening to them at all, because quite frankly, they both blow dog! 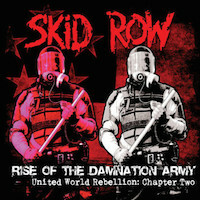 But things changed last year when they released the very underrated United World Rebellion : Chapter One, a five track album that took Skid Row back to their roots. When Skid Row decided to give it a go again with Solinger instead of charismatic frontman Sebastian Bach, not only did they lose a fantastic frontman and singer, but their material was just a big alternative mess. With last year’s E.P., the band was back at playing the sleazy heavy metal that gave them their name and made them popular. The record made a big impression on me and it also made me even more pissed off about the whole E.P. format. This was so damn good that I craved more. What do you mean we can’t handle more than five songs? I eat twelve songs for breakfast! Still, the “chapter one” in their title revealed that more music would be coming our way and now that band has released the sequel (or continuation, if you will) to that E.P. Of course, with another E.P. To be honest, the risk of Skid Row abandoning their new-found love for their old style was about as big as Rachel Bolan (bass) forming a BFF relationship with former singer Bach, so I wasn’t worried at all that the second chapter would be some weird alternative thingy. But that doesn’t mean that the songs for this E.P. would automatically be great. But opening track assured me that they wouldn’t cut down on the quality. “We Are The Damned” is a classic sounding Skid Row bouncer, hard and edgy but still catchy enough. They keep that up with “Give It The Gun”, a real killer on which Solinger even sounds like Sebastian Bach. If it was a calculated move, I can only speculate on – but I won’t. Ballads was always a strong side to Skid Row. Being a bunch of metal heads (and a punk – Bolan! ), the risk of going cheesy with those was very small and the stamp they got as a pop metal and a ballad band was always erroneous. As the band has never cared at all if they were being made a mockery of or what people said, they kept on recording ballads no matter what and on this album it’s called “Catch Your Fall”. Yes, I know, an unimaginative and quite cheesy title, but just like most of their ballads, this one isn’t cheesy at all – it’s heavy. And it’s really good. They falter a bit with “Damnation Army” – I have never been into punk and I always believed that the punk-metal was Skid Row’s weakest side. It’s not a bad song, though, I will go with decent here. The last original track here is called “Zero Day” and the song is just bloody awesome! This could have been taken from Slave To The Grind (1991). They finish this off with two covers. I don’t mind covers at all, but if I get seven tracks, I want them all to be originals, thank you very much. The first one out is “Sheer Heart Attack” by Queen. Queen and Skid Row aren’t exactly the same kind of band, but “Sheer Heart Attack” is one of Queen’s few metal songs and this cover works really well. However, their version of Aerosmith’s “Rats In The Cellar”, works less well. The metal of Skid Row and the classic rock of Aerosmith doesn’t mix that well, I’m afraid. With this E.P., Skid Row has made it clear that they are back on track musically and that they finally know what they do best. The overall sound on both this and its predecessor is classic Skid Row metal and vocally, Solinger does some really great Bach impressions here and there, but for most parts he has his own identity even though he his very much the same kind of singer. I know I might have written it before, but I can’t help missing Sebastian Bach when I listen to Skid Row. This sure isn’t fair to Solinger who has more than paid his dues with the band, but I don’t really see Skid Row making it big again with this line-up. The biggest chunk of their fans wants Bach in the band and the way I see it, a reunion with Bach (and drummer Rob Affuso too, please) is the next logical step for this band. Still, the fair thing to do is to give this (and its predecessor) a shot because I can’t really see any Skid Row fan not like this. Hopefully they will make a long player version of the two E.P.’s – one 12 track CD would be the ideal format, so I’ll keep my fingers crossed for that. Until then, let’s just enjoy the fact that Skid row has found their way and are back with a bang! Hmmm. Well, I didn’t like the first EP much to be honest with you. It bothered me that I ordered it, all excited about new Skid Row, and then about 2 months later they reissued it with two bonus cover songs. So I see this time they included the covers right off the bat. But I don’t know if that’s enough to warrant me getting this. I like Solinger just fine, but there’s no question that there’s only one Sebastian Bach. Ah, well, if you didn’t like the first there’s a good chance you won’t like this either. It’s in the same vein musically. But check out the songs featured here and see what you think. Which were the bonus songs on the first E.P. ?